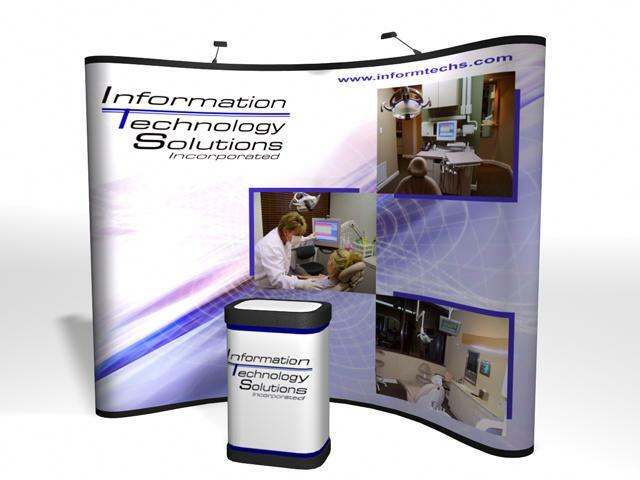 This 10’ Economy Pop Up Display with all photo mural panels is a light weight model pop up with magnet to magent connection. It comes with 6 ink jet photo mural panels, 2 fabric panels, 2 halogen lights, shipping case and a fabric case to counter kit. ShopForExhibits is rapidly becoming a leading retailer of trade show display accessories on the internet, and because of that, are regarded to be a wealth of expertise about the trade show exhibit industry. Lowell Nickens, who is the owner of SFE, began his career in the trade show business by starting a trade show decorating company called Classic Exposition which he ran for 10 years before selling the decorating business to GES. From there, Nickens created an exhibit manufacturing business called Classic Exhibits which he ran for 21 years before moving into the online business marketing trade show displays. Most of the product lines that Classic distributed before 2006 were systems that Lowell created himself, and the knowledge of all the products he sells can be an resource in choosing which system you should purchase. After reviewing the products we offer, please feel free to call and let us answer your questions. Nothing is quite as sure as change, which is why having a trade show display supplier like Classic Exhibits has helped so many distributors weather the tough times through the development of so many new high demand products. When other suppliers were content to hold onto a group of proven existing products, why did Classic venture out and risk valuable time and money to create new products? They happen to notice that one or two of the aluminum shapes that they were already purchasing at that time, had a significantly lower cost per linear foot in comparison to others, and determined that those shapes should be considered for future product development. Their ingenuity and creativeness have produced several entire lines of custom modular hybrid displays and provided the market something new to look at. Heading the list of new custom modular hybrid displays is the Perfect 10 followed by the Magellan Miracle and Sacagawea tension fabric displays. As a result of all the great new trade show exhibit offerings that Classic has to offer, it’s no surprise that Classic maintains a strong market position with their group of distributors, and appears not to be letting up one bit as they march into the future!